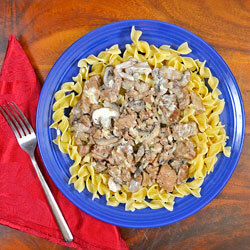 Beef stroganoff originated in Russia in the later part of the 19th century. A similar recipe can be found in a Russian cookbook from the 1870s. There are a number of stories about it’s true inventor though. One is that it was created for Count Grigory Stroganov, a man said to have loved to entertain, but had no teeth. The dish would be ideal for him to consume if indeed he had no choppers. A chef for Russian diplomat Alexander Stroganov is also credited. Regardless of origin, the recipe bears the family name. The dish made it’s way to the United States in the late 1940s after World War II. 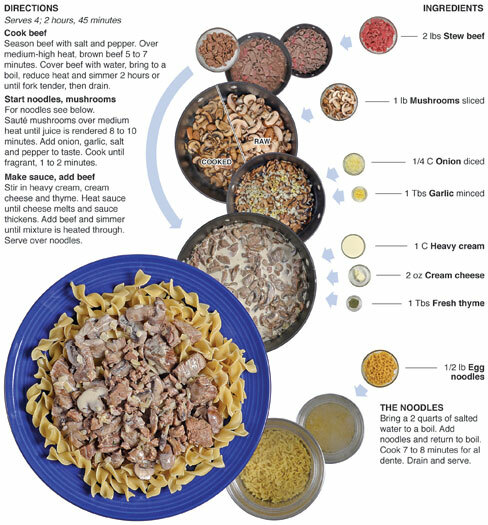 There are countless variations, but most feature beef, noodles, mushrooms and sour cream. For this recipe, I stick with tradition but I change it up a little with the sauce. Instead of sour cream, I use a combination of cream cheese and heavy cream. For extra flavor – onion, garlic and fresh thyme are added, creating a rich and savory sauce. I made this for our family get-together Christmas Eve. I found stew beef at a great price the day before and thought beef stroganoff would be a good dish for the party. Put it with the pulled pork sandwiches my Mom was making and we would have enough for a couple of main dishes to feed the relatively small gathering. I would usually have made a flour based cream sauce for a dish like this but I saw the heavy cream/cream cheese combination in the Nov/Dec issue of Cuisine at Home and thought I would give it a shot. I really thought the overall dish tasted great. 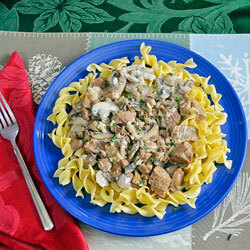 The fresh thyme and mushrooms with the savory beef were dominant flavors and the cream brought everything together. 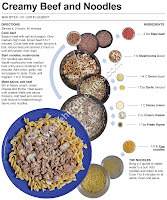 This dish is named after the Russian Stroganov family. Modern day High school in America would have been brutal for the Stroganov kids. I bet they wouldn’t set foot on the bus without hearing things like “Is your beef raw after strog an-ov?” or “Do a lot of strog an-ov this weekend?” Even the most righteous kids would find it hard to resist teasing their peers with a last name like that. Season beef with salt and pepper to taste. 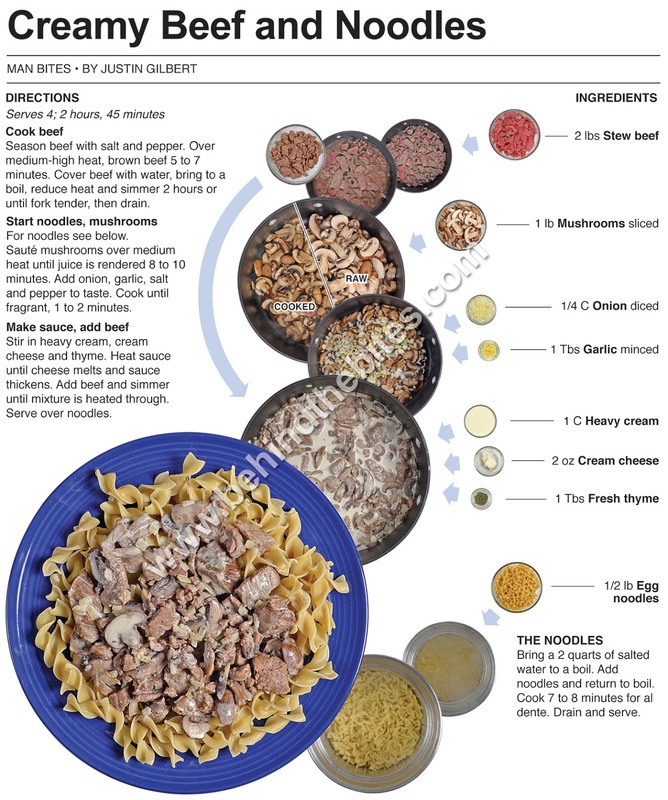 Over medium-high heat, brown beef in a large pot. 5 to 7 minutes. Cover beef with water, bring to a boil, reduce heat and simmer 2 hours or until beef is fork tender, then drain. Sauté mushrooms over medium heat until juice is rendered 8 to 10 minutes. Add onion, garlic, salt and pepper to taste. Cook until fragrant, 1 to 2 minutes. Stir in heavy cream, cream cheese and thyme. Heat sauce until cheese melts and sauce thickens. Add beef and simmer until mixture is heated through. Serve over noodles.